Light Control UV RAY Protection Thermal Insulation Mildew Resistant Fade Resistance. Perfect for front porch pergola cabana covered patio gazebo dock beach home. Curtains without liner impede 85%-99% light and UV ray. Rust Proof antique bronze grommet eylet ( 1.6 hole) enable the curtain to last long. Style: Classic traditional and casual. 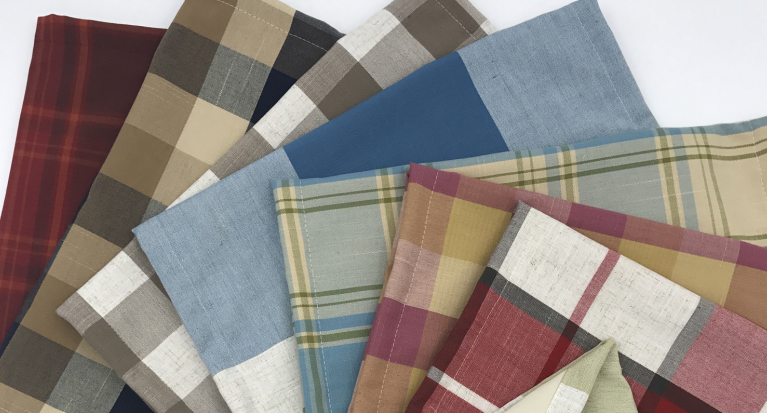 Pattern: Classic plaid, checkered, gingham. Fabric material: 55% polyester 45% cotton. Perfect for everyday use party holidays catering cafes special occasions brunches potlucks BBQ's buffets dinners events restaurants entertaining weddings picnic or outdoor table setting etc. Create an idyllic outdoor space and convert your balcony patio or garden area into an outdoor room through the use of curtains. In more exposed spaces source durable weatherproof fabric which will offer shade and protection. 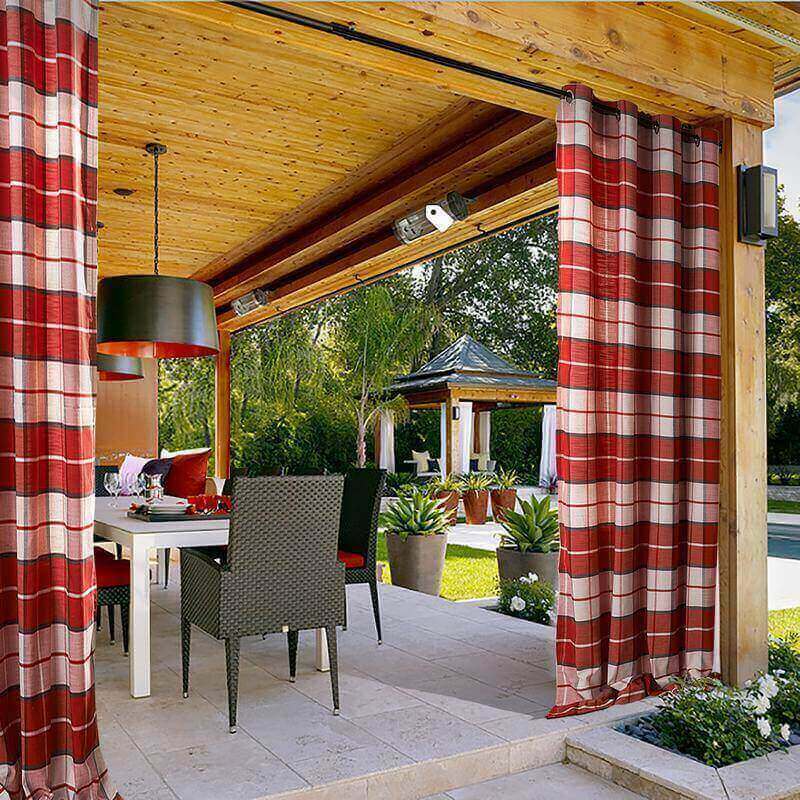 Outdoor curtains work best in warmer climates offering shade and bug protection. These fabrics often don't need extra lining since they're specifically constructed for these purposes. They defy mildew moisture and fading. They waft light insects away give privacy and a lovely summery air. Diaphanous drapes allow filtered sunlight in to create an intimate outdoor living space. They can be taken down for winter storage.If you do add a roof circle it with curtains. 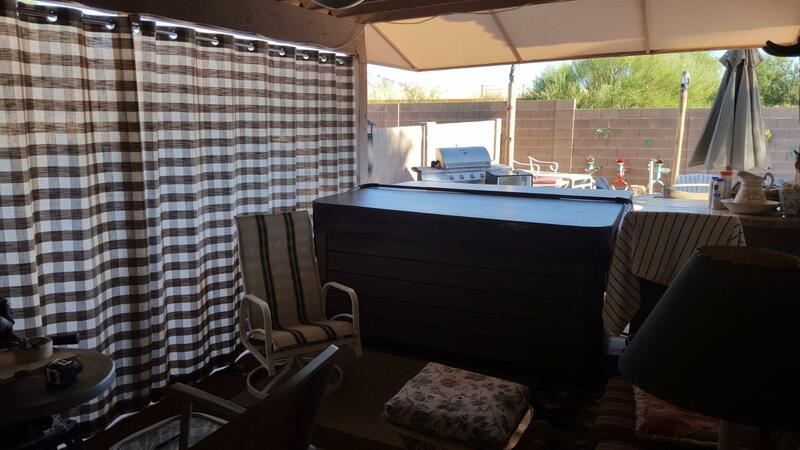 You can easily block a breeze when it becomes too chilly plus aesthetically their addition will give your covered patio a tropical cabana feel. WIDTH: Add fullness 1.5-2x. If your traverse rod length is 120 inches, then over all width is suggested to be 180-200 inches, then single panel width to order 90-100 inches. LENGTH: Measure the top of grommet to bottom. Finally got my curtains up. I purchased the brown to go with the stucco on the house. The quality is great for the price. The only thing that I would care to comment about is wishing there were pockets at the bottom to weigh them down a bit. Our patio cover is really tall and so there is a space between the bottom and the ground. When the breeze kicks up, the curtain blow a bit. I plan to sew in some weights to keep them grounded . Very happy with curtains! They look gorgeous on my linai. Quality fabric and really keeps the sunlight out. My linai feels very cabana like. It's like being on vacation everyday! Not only fast shipping that was a happy surprise, the fabric is high quality, the stitching is perfect. I was happy with the wide hem these flow to floor just like I wanted too. I bought mine in 150 inch width and am using them as a room divider. I spent days reviewing many curtains, although these at time I ordered didn't have many reviews I ordered them trusting pictures and comment. Stylish along with having a great checkered pattern, I ordered the taupe and it's true taupe! I say Fabulous ...and I plan to order again. Purchased for patio door,excellent,good equity.. Purchased for patio door, great quality for the price, delivered early. So happy, better than expected! Drape and weight excellent! Recently moved plan to reorder in taupe. 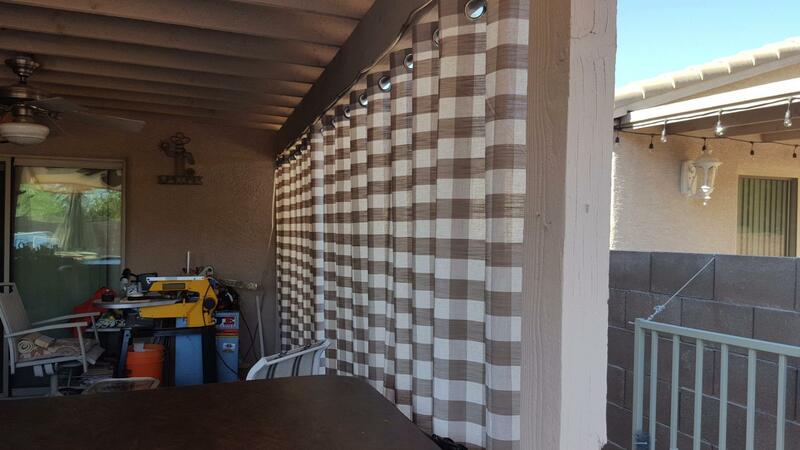 I love these outdoor curtains... delivered ahead of schedule, looking exactly as pictured , and were ready to hang with no wrinkles! I am very please with the curtains. I have them outside hanging on the patio. I hope they last many years. They were not cheep.